I belong to a FlickR group called Let's Swap ATC's. There is always a theme you can sign up for but there is never pressure to sign up for any swaps. As you all know during the fall and winter I am busy with my craft shows and painting up a storm so paper gets put aside reluctantly and so trades are put on hold. Since the Christmas holidays I have taken paper back up and got into trading again and here are a couple Arch shapes for the technique challenge. 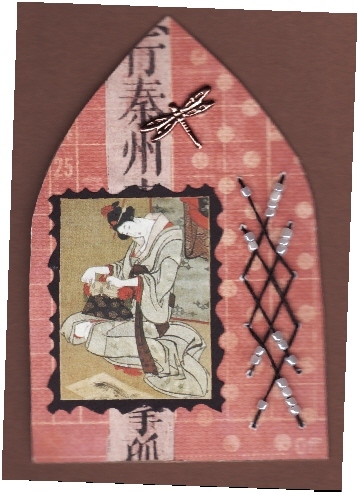 As you all are becoming aware if you don't know already I lurve anything with an oriental theme so I am always using an excuse to try my hand at something a little different or just putting something together that represents my love for Chinese or Japanese themes. 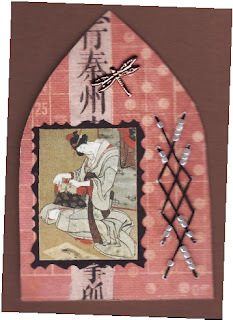 Here is one arch I made with some K and Company scrap paper, I added some stitching and beads, the image was sent to me by one of my trade partners or arty friends, I can never remember they are all so generous, and a strip from a Chinese prayer book behind the image. And this arch below is my gilded birdcage that fit just nicely onto another arch shape. I just had to cut the corners at the top a bit. 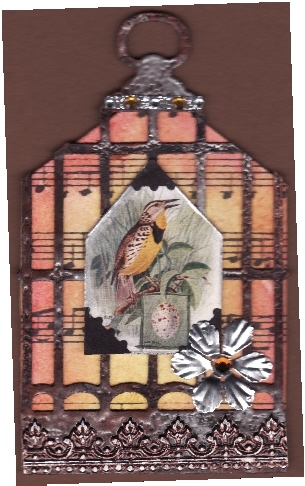 I used some music paper on the background and used colours from the ARTCHIX bird image around the outside edges, orange and yellow.I mounted the image on a piece of chipboard for some stability and added it to the front of the cage then added some chocolate brown German Scrap, again ArtChix and sanded it a bit to reveal the silver underneath. I punched a flower out of metal repair tape then used the embossing plate that the flower punch comes with to emboss it then added a gem. And that is it. I hope whoever I get for a partner likes it. 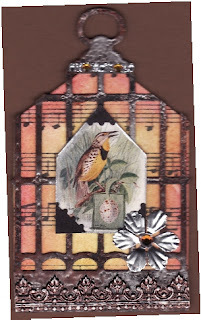 I am working on an altered matchbox with the theme of birds, it is really starting to take shape. Have a creative day and you know me, always love to read your comments. Just beautiful Les.. love the Asian one of course but the bird one is lovely.. am sure your partner will love it..
Love that bird one. I think I might see inspiration for a painting in that one! Both of them are beautiful! I love the stitching on the Asian one and the bird cage is to die for. I'm sure they'll be treasured. Stunning! Love the arch shape for ATCs. Stopped by to see what you have been working on lately, vice nice! Have a great March Break!